Notice the Lookup Person button under DAT Users located within the Access section. 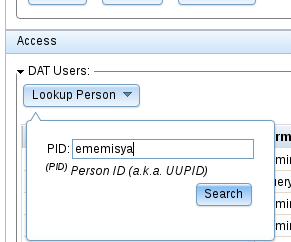 Click Lookup Person and enter the PID of the person you wish to assign access to (you may also click the person's pid from the DAT Users list if they already have any DAT access assigned). 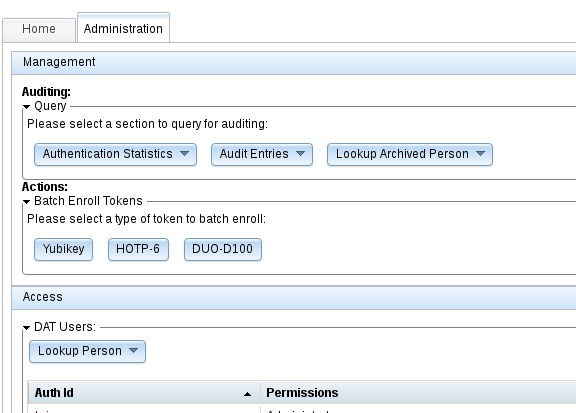 After query completes, you will be shown a list of available permissions to assign to this person on the left column, and a list of already assigned permissions on the right column. Here you may drag and drop multiple permissions from one side to the other which will perform the assignment operations. Lets assign Query Person & Manage Account permission to this person. And drop it on the right hand side column. Once the permission is on the right hand side, the permission has been successfully assigned. 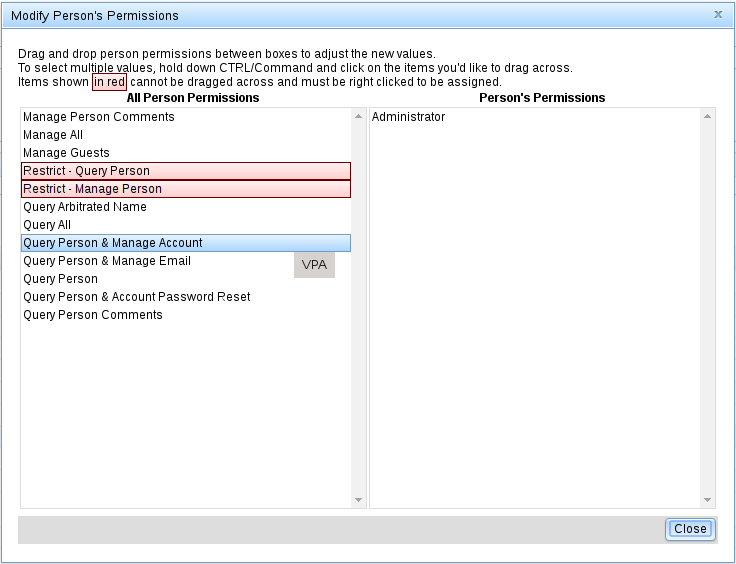 Permissions shown in red are special permissions meant for restricting the already assigned permissions on the right hand column. For example, Restrict - Query Person restricts the Query Person portion of any access assigned on the right hand column. Referring to the example above, Query Person & Manage Account combined with the Restrict - Query Person restriction will result in an access combination where the user will be restricted to only being able to query for the accounts of people restricted by the criteria Restrict - Query Person was assigned with. In this case Restrict - Query Person will restrict all query operations by an Organization Code. Red permissions must be assigned by right clicking them and providing the filtering information required by the individual permission. Notice the pop-up box asking you to provide the Organization Code(s) needed for this restriction scope. Enter one or multiple (comma separated) organization codes in the text box as shown below, then click OK to continue. Important: In the case of combining Query Person & Manage Account with Restrict - Query Person alone, it will not be enough to limit a person to manage accounts restricted by the criteria set with the assigned Restrict - Query Person permission. Having only the two permissions assigned will only restrict the person from querying all persons. A Restrict - Manage Person permission will need to be assigned alongside the Restrict - Query Person to fully achieve assigning the set of permissions required to only allow a person to query and manage persons in a given criteria. Hold, drag to the left, and drop. Once you have finished assigning permissions, click to continue. Note that in the figure above, the Authorized End-Point Operations: header lists nothing. Notice how the Authorized End-Point Operations: was updated to list all endpoints available using this Service. To remove access, simply drag and drop the role to the Available Permissions box from the Active Permissions box.